It took the strength of more than 15 firefighters to pull the animal out of the mud filled ditch in a 90 minute rescue operation. 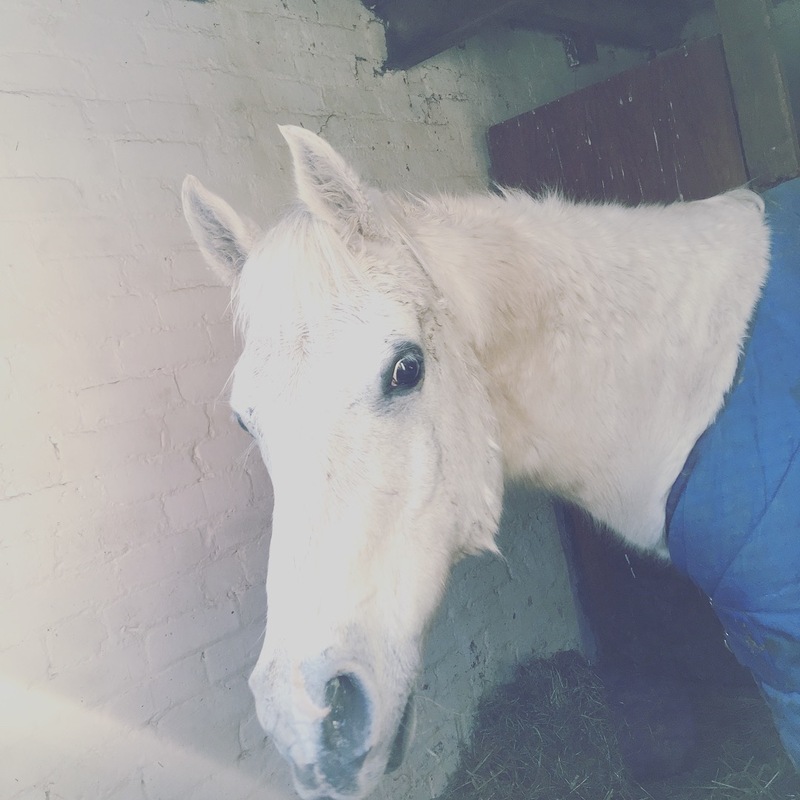 The 26-year-old grey Arabian Arab is recovering well after a three hour ordeal which began when he slipped on a muddy bank on the edge of a field at Sarn Farm, St Martin’s, Oswestry, at about 5.30pm and toppled onto his back into a ditch, almost 1ft deep with mud. Tangled in wire fencing and hedgerow, the distressed horse was unable to get back onto his feet when he was found by the owner’s daughter Rosie Mackay (26) and partner Louis Davies who had been searching for the pet horse by torchlight. “The back legs were trapped in pig wire and he was upside down, 3ft or 4ft down the bank when we found him. It was pitch black. We were panicking and the horse was shaking. I thought he was going to die,” said Rosie, a mother of two, of Castle Street, Oswestry, who dialled 999 while Louis used wire cutters to free the animal from the fencing. 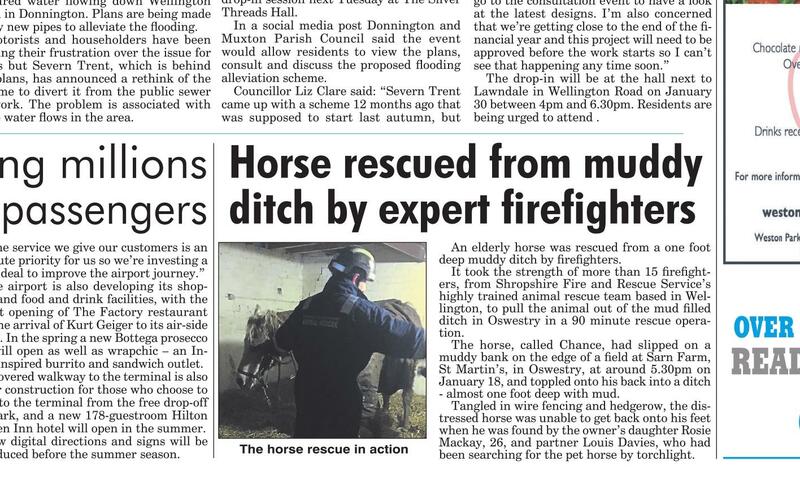 Oswestry and Ellesmere firefighters arrived at the scene and immediately called out the specialist crew from Wellington fire station who are trained in large and difficult animal rescues. They cut away undergrowth and wire fencing and put up floodlights ready for the rescue team, said Crew Manager Rob Evans. A vet from Dee Valley tended to the animal while firefighters got to work to rescue Chance at just before 7pm last Thursday night. (Jan 18) Strops were carefully threaded under the animal’s waist and chest in an intricate operation before firefighters could pull him from the thick mud. “He got to his feet and managed to walk on her own, hobbling a bit with a sore leg,” said firefighter Barry Morfill, part of the rescue team, led by firefighters Phil Woodhouse and Jez Long, all from blue watch Wellington. “The firefighters were superb, they were so good,” said Rosie. “I thought they were going to have to put him down but now Chance is settled in the stable today and recovering well,” added Rosie, whose mum Mandy owns the horse. Firefighters from the animal rescue unit learn the techniques to move and lift a large animal to safety and the best practice in all manner of animal rescues such as pulling a horse out of a steep ditch or river and rescuing a rider trapped under a horse. Tong Park Farm is where firefighters practice their skills on rescuing farm animals where they also have access to barns and a pool to train in water rescues. Shropshire Fire and Rescue Service gets called out to an average of 70 animal rescues annually with the number increasing every year.